PoppaNut and I had our good friends, Brooke and Brad, over on Friday night. They are expecting their first baby, a little girl named Lily, in November. 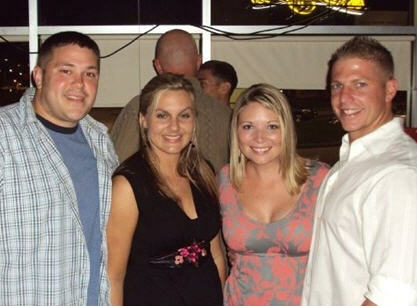 In fact, I went to Brooke’s baby shower the weekend before. It’s been so fun watching them get their home ready for little Lily. The spare bedroom that used to hold Brooke’s extensive Beetles collection is now outfitted with pink and green decor. With the room ready, we are just waiting for Lily to arrive. PoppaNut was actually very good friends with Brooke and Brad before I ever came along. When I first met them, they couldn’t have been nicer. They welcomed me with open arms, and we have all been close since. And now we will be even closer now that Lily has asked PoppaNut and I to be her godparents! When Brooke and Brad came over, they gave us this note … and it made me cry like a little baby! 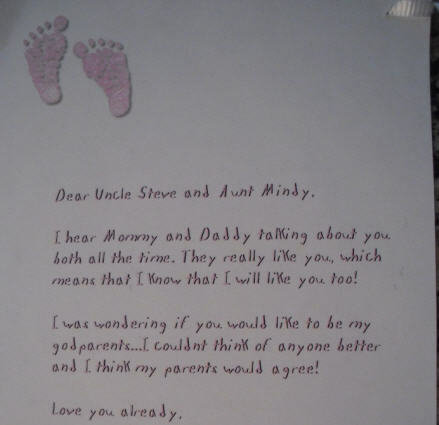 No one has ever asked me to be a godparent, so I was so touched by this note. I’m even more excited to meet the next Cole family member now. And that’s life in a nutshell … friends really can turn into your family after all. Congratulations on being asked to be god parents! The note was an awesome idea. A great little touch to a special moment. This was a really nice way of asking someone to be a godparent. Hope you don’t mind, but I used this but put my own little sayings in it so it makes it special to the couple I am asking to be god parents to my little bundle of joy due in Jan 2016. First, congrats! Such an exciting time … And secondly, of course! Use whatever you find on my blog to welcome your little bundle of joy with open arms! Congrats, again! !